All hail fish in a can! I love fish in a can. Not just tuna, but also salmon, octopus, kippers, anchovies, and yes, sardines. 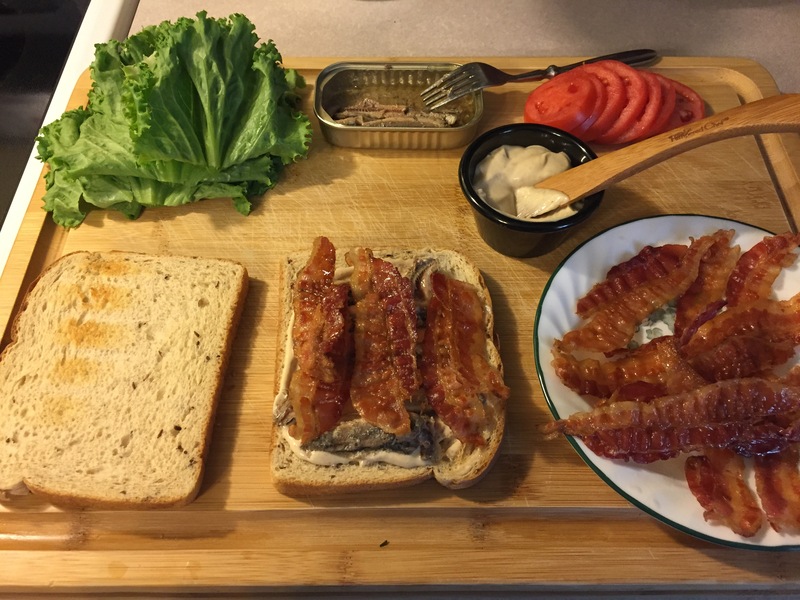 Fish in a can are a delicious, easy, cheap source of protein. Often, I will eat kippers or sardines straight out of the can. But every now-and-again I want to COOK with them: with pasta, in an omelette, the possibilities are practically endless. 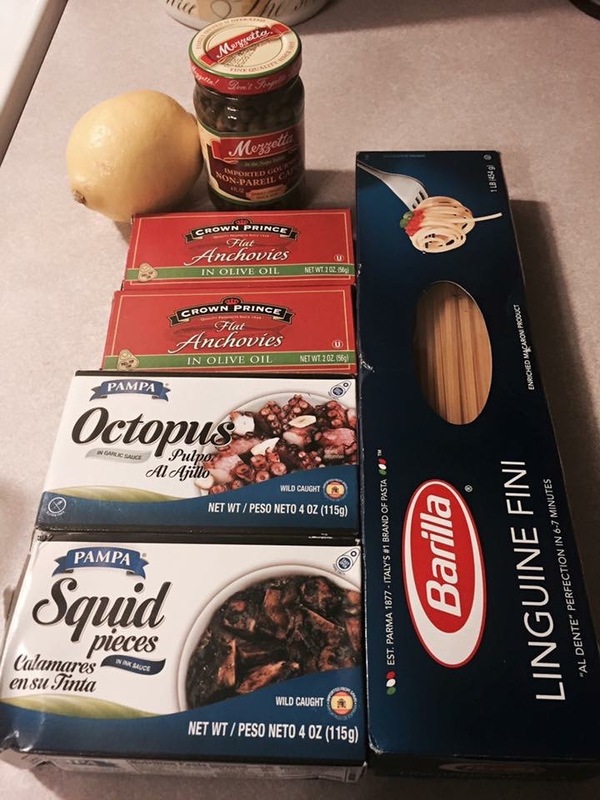 Here’s a photo from a recent Facebook post of the ingredients of an easy weeknight supper. For the record, I will not buy the squid again (too much ink, not enough squid). In a small bowl, combine garlic paste and mayonnaise until blended and smooth. 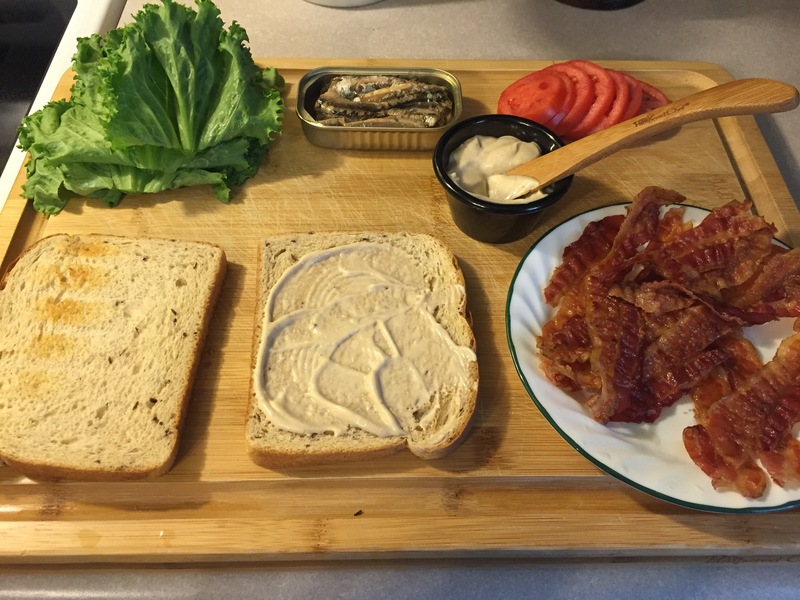 Spread mayonnaise on one side of all 4 slices of bread, as thickly as desired. Open the sardines and drain off any oil. 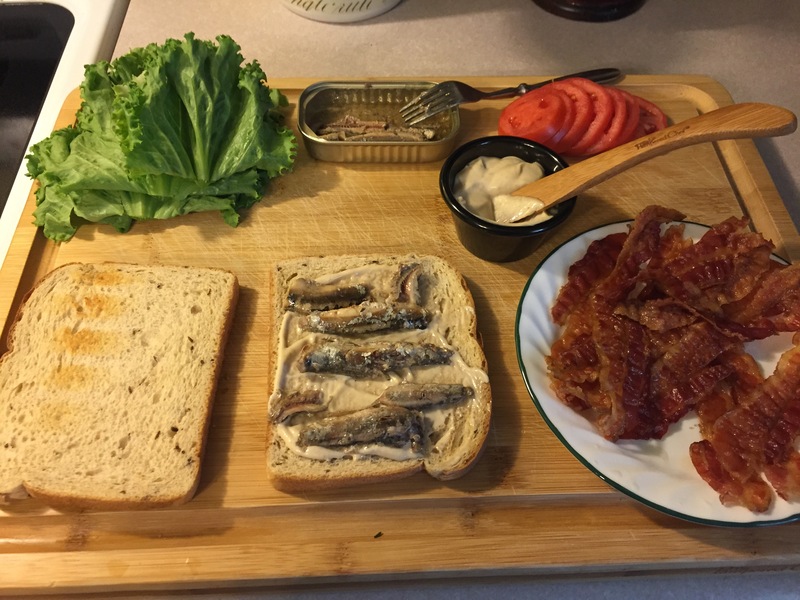 Using half of the sardines for each sandwich, arrange sardines on 2 slices of the bread. 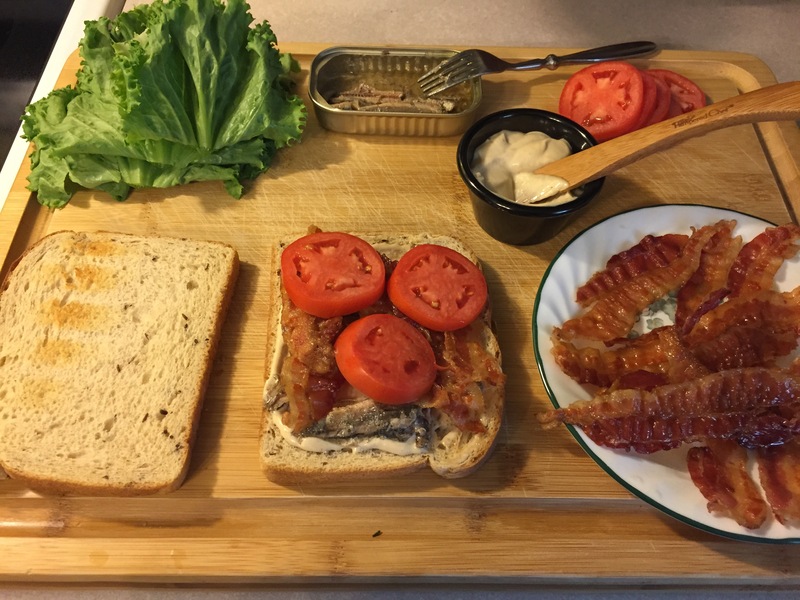 Top sardines with bacon, lettuce, and tomato slices. 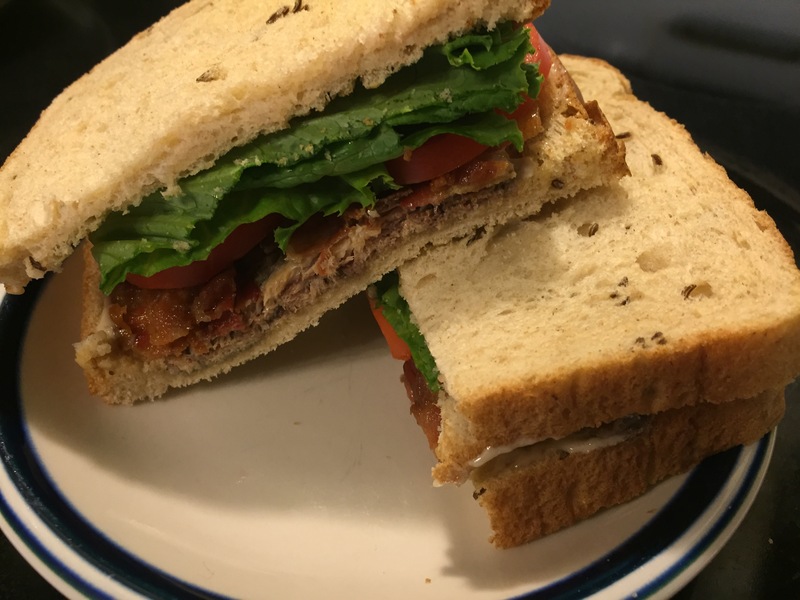 Place second slice of bread atop each sandwich. 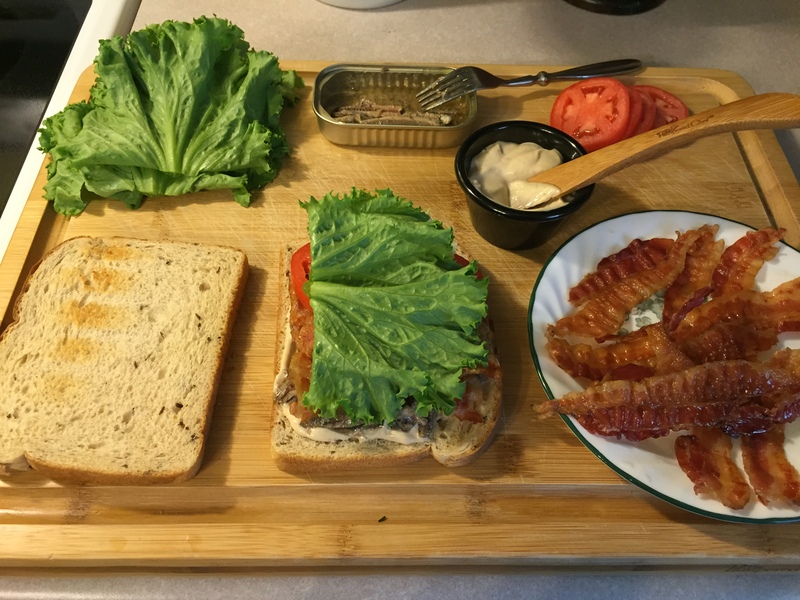 Serve sandwich sliced in half, if desired. 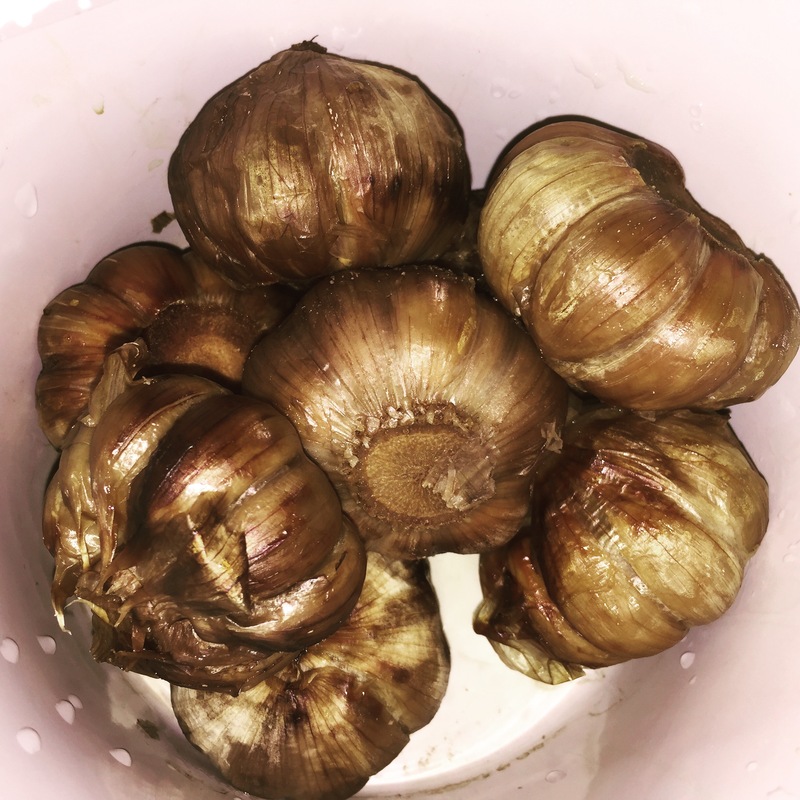 My Black Garlic is finally finished with 40 days of fermenting this weekend! 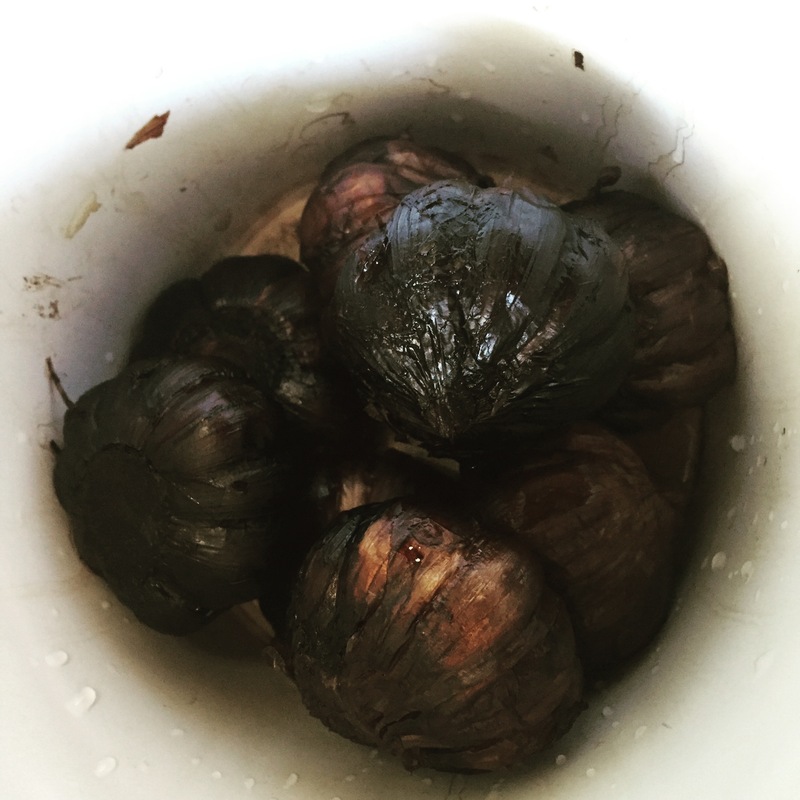 When it was starting to get close I started to brainstorm dishes I could make with these precious, dark, earthy bundles of deliciousness. Even though Black Garlic & Black Rice are technically Asian in origin, this recipe is actually Latin in inspiration, specifically Cuban. Call it my own weird fusion cuisine. Combine garlic, OJ, salt, pepper, & spices. Whisk together to make a marinade. Spread chicken pieces in a single layer in a 13″X9″ baking dish. Pour marinade over chicken. Cover with plastic wrap & let marinate overnight. Roast the chicken in the lower part of the oven 45 mins-1 hr, spooning the sauce over the chicken during the last 10 mins of cook-time. Black rice is black because of the outer coating of black bran on the grain. Black rice is a “superfood” & has more antioxidants than blueberries. Black Rice looks purple when it’s cooked. Black Rice is also known as “tribute rice”, “longevity rice”, and my personal favorite, “forbidden rice” (Remember Lambada, the forbidden dance?) because it was reserved for the Emperors of ancient China. Place 1 C of rice in a saucepan. Add 1 3/4 C water, bring to a boil & stir. Reduce heat (to low) and simmer 35-45 mins. Remove from heat & allow to stand covered for 5 mins. Fluff with a fork & serve. Pour the dried beans into a large bowl and cover with water. Put the bowl in the fridge 8 hours or overnight to soak. 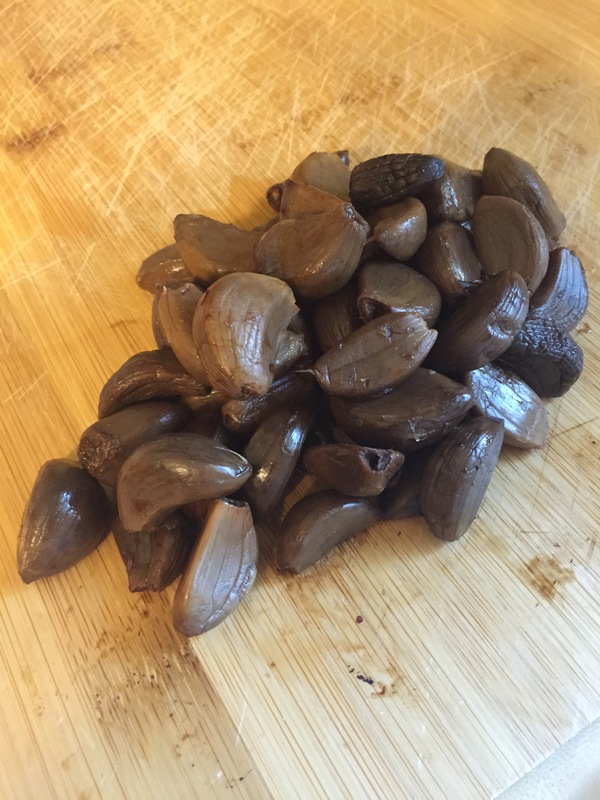 Before using your soaked beans, rinse them thoroughly, and pick out anything that looks funky (pebbles etc). Put your soaked beans into a large pot and add sofrito, hammock, spices,and bay leaves. Pour the chicken stock over the beans. Bring the beans to a boil over high heat, then reduce heat to medium-low. Cover and simmer the beans 2 hours, or until tender. When the beans are cooked, season with the vinegar, salt, and pepper. Serve this dark, delicious dish with some freshly-sliced avocado (for a pop of color).